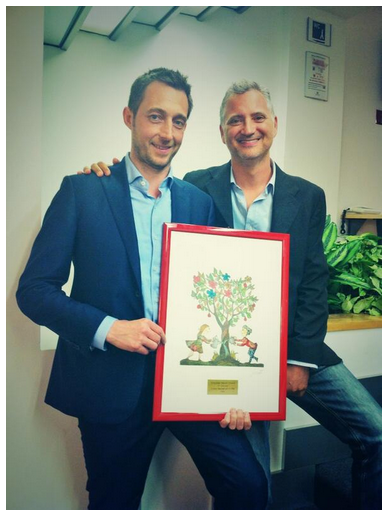 “working together” wins a prize. 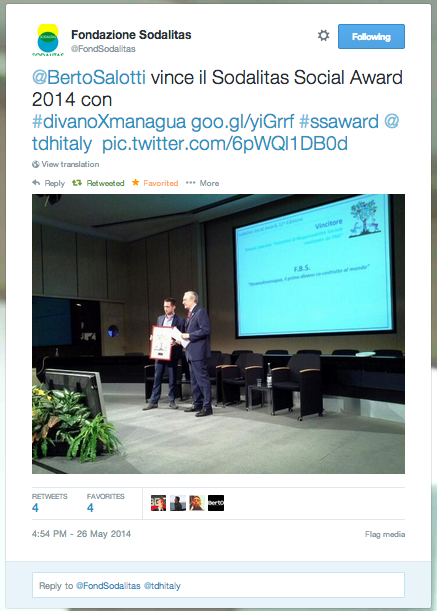 Sodalitas Social Award 2014 #divanoXmanagua Berto. About a year and a half ago, we had the idea and the desire to make a sofa with the public. We have always shared – thanks to social media in all its forms – our company’s life and the history of our business. In 2013, our desire pushed us to go further to share an entire project, the production of a sofa. How could we convey the emotion and value that goes into every sofa made exclusively by hand by people who have been doing this for generations? How we give recognition to our Master Craftsmen? How to make young people fall in love with artisanship? What if it we opened the laboratory to “show” in every sense of all this? The path that led us to conceive – and then realize – the #divanoXmanagua has gone through these questions. Through a network of partnerships – primarily Terre des Hommes Italy and the Training Centre for Decorating AFOL Meda – we managed to start up a project that in the end was more than capable of giving positive feedback. So, off we went, knowing that no one had ever traveled this road before “a co-created sofa” – and here we have to thank prof. Stefano Micelli, who baptized our initiative with the term used by the Anglo-Saxons in these cases as a: “crowd-crafting” project. We set off on our journey not knowing what to expect, yet hoping to find good things along the way. Moreover, good things did come: there was enthusiastic participation in all six sessions, the beginning of collaborative institutions formed, and the endorsement of personalities such as, Alessia Mosca and Beppe Severgnini and the involvement of young people who rediscovered the love of craftmanship of the Brianzoli, founded by previous generations. The intoxicating effect of spreading good will between Berto and other artisans of the area resulted in a final dinner – just 12 months ago – in which we collected well over 7,300 Euros to be allocated for Upholstery and wood working courses in Managua, Nicaragua, a place where young people are fighting not only for work, but often also for their life, directed by Terre des Hommes Italy. 1 – The sofa #divanoXmanagua is a piece of high quality upholstery and tailoring from every point of view, unsurpassed craftsmanship, design and strong personality; many thanks goes to the success of the Italian label in the global marketplace. 2 – Project # divanoXmanagua is a permanent project, which continues to create benefits: for every sofa sold, we pay a percentage of 2% to Terre des Hommes Italy for the development of courses in Managua. For all these reasons – and many others impossible to summarize in a single post, but who are nonetheless part of the professional and human resources involved in the project – the Sodalitas Social Award Foundation Sodalitas won just yesterday fills us with joy. Being recognized with the most prestigious Italian award for Corporate Sustainability, the experience and value of taking the less travelled path, as often happens in life, we realize are not alone. Our thanks goes not only to those who have paid the premium, but also of all those who believed in # divanoXmanagua. It was not easy, nor obvious, but thanks to them, we won, and – more importantly – we have shown that the sharing the road to success makes everyone a winner.